MDI Debate: The Quran or the Bible: Which is the word of God? A public debate examining the claims by Muslims and Christians whether or not the sacred scriptures of their religions are divine in origin. 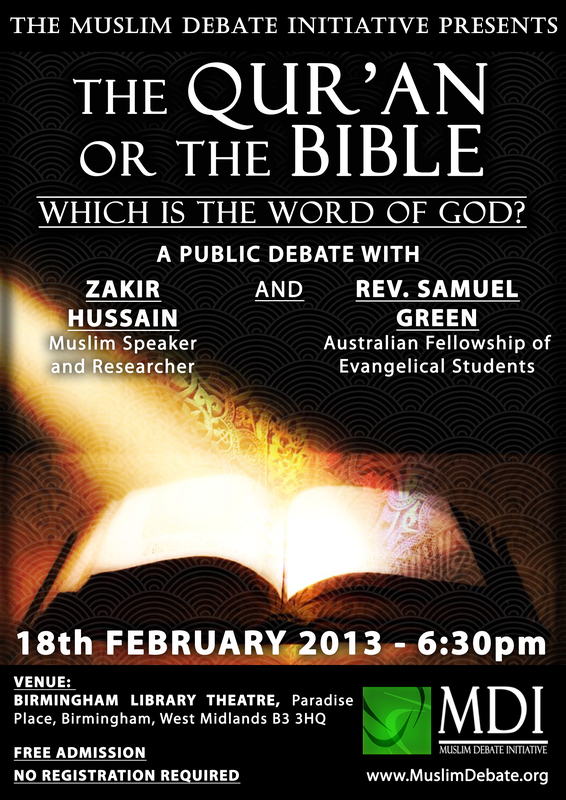 Zakir Hussain (MDI UK) debates experienced Christian publi speaker, reverend Samuel Green (Australia) on this profound and interesting topic. Venue: Birmingham Central Library Theatre, Paradise place, Birmingham, West midlands, B3 3HQ. Is this a good title? I think that the Bible contains much that is from God so the either/or black and white dichotomy is not valid or helpful in my view. The Quran also suggests that there remains in the Bible truth from God. I think the title should be changed. Yes, I agree with br. Paul, I too think this is a more appropriate Islamic position. The Christian scholars themselves have put so many holes in the Bible that it is difficult to know from which hole the Bible is breathing and from which hole it is farting ! The Bible is mostly an anonymous document , it has forgeries in it , it has factual errors , historical errors, scientific errors , vulgar language in it , it has tons of internal contradictions . If the Bible is from God then God is also anonymous , vulgar, commit factual errors , contradict himself again and again !!! Stop calling yourself Jesus and acting like a fool…you’re not funny and your understanding of the bible is not very much, and there are Islamic apologist that know better than to speak like you. If the bible is not from God the koran doesn’t have much hope so find something worthwhile to say. I do enjoy reading what some Muslims have to say but you don’t do yourself justice. When did Jesus who is here speaking from the cradle have the book given to him from Allah? Just because it has been used before (ie by Deedat) doesn’t make it correct or appropriate to use now – especially if we want to improve our dawah. ‘For future reference what title do you suggest?” I dont really have a suggestion – if the point of the debate is the Quran vs Bible. Its just wrong headed. I had hoped MDI can move beyond the us vs them format so popular in the 1980s. In the case of the Old Testament, it is of similar content with many prophets. But i wont be arguing that the ENTIRE bible is not from God. I will just attempt to demonstrate the muslim position which is that the Quran is gods final message to mankind and that it is the criterion to separate the truth from the falsehood in the previous scriptures. I dont view this debate as “us” vs “them” and i have respect for samuel green so i think this will be a positive event. well that’s a much more Islamic position and worth debating. Bro i should say you that your debates with James White and David Wood were top class ,you was very academic in those debates plus you were thoroughly read . I want to see this debate also on a similar academic level . Next thing which i want to bring to your notice is about the way Samuel Green debates , which is very unacademic and superficial when it comes to the history and compilation of Bible and the Quran . You will never see him quoting Biblical Scholars dealing with the history of the Bible and scholars dealing with manuscript evidence , he will just say that there are a lot of manuscripts of the Bible , a very typical of Christian apologetics .He will never bring up the additions ,deletion and forgeries found in those bible manuscripts , he will never bring up the psedoepigraphia or forged writings in the Bible , he will never bring up how many things in the New Testament can be really traced back to Jesus . Coming on to the Quran he brings up the hafs and the wafs way of reading , compelety ignoring what scholars say about it . He will never quote scholars whether Muslim or non Muslim who agree that Quran is preserved . He will bring the daif hadith which ascribe extra suras to Ubay in complete disregard to the sciences of hadith like wise he will say that ibn masud musaf has variants , again quoting from the daif hadiths . He thinks uthman destroyed the Quran by burning it !!!! , again no scholars are quoted .He thinks there are different Qurans present in the world today !!!! , just another deluded missionary . Brother Zakir if you deal with the points which i mentioned above you may completely destroy his unscholarly , unacademic and highly superfluous approach forever . The Quran or the Bible: Which is the word of God? Surah 74:25 is a perfect description of the Quran, if Muhammad was mortal. Brother Zakir, assalamu ‘alaykum. I am looking forward to seeing this debate tomorrow in sha Allah, I would like to see though some other debates that you may have had with christians if you can direct me to them. Also will there be any literature on sale, or being given out for people to read and use in the dawah which is very important.